The leader of the Indigenous People of Biafra, IPOB, Nnamdi Kanu has reacted as the presidential candidate of the Peoples Democratic Party, PDP, Atiku Abubakar described President Muhammadu Buhari as a fake Fulani man, Daily Post has reported. 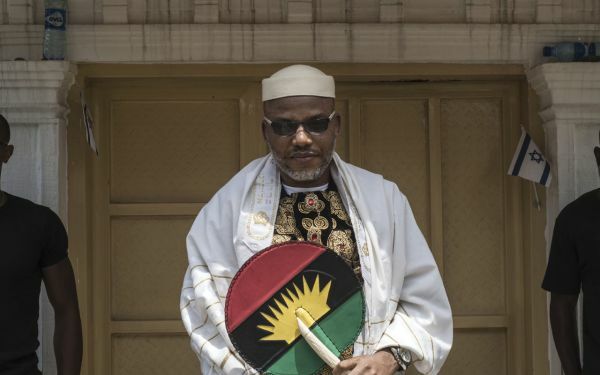 According to Kanu, the statement by PDP presidential candidate laid credence to his earlier claim that Buhari was Jubril of Sudan. ”A real Fulani man would not drag his followers into extreme poverty like what is happening under the APC administration,” Abubakar had said. However, the IPOB leader wondered why Buhari could no longer express himself fluently in Fulfude. In a tweet, Kanu wrote: “Yesterday, Atiku Abubakar confirmed that the current @NGRPresident (Jubril) is a fake Fulani man because he cannot speak Fulfulde. “Late Buhari took pride in speaking Fulfude (his mother-tongue) fluently, how come this man from Sudan is making a fool of everyone?